I’m sure a lot of you are already aware of this, since the changes have been up for over twelve hours, but I figured I’d let the folks just showing up to the party know about the rather extensive changes I’ve implemented on the site this weekend. If you’re a frequent Protagonize visitor, you’ve probably discovered that our Stories area was getting rather cluttered, full of a mix of poetry, screenplays, song lyrics, and roleplays in addition to the typical narrative prose we had originally started out with. This is probably my fault, as I never anticipated that (a) the site would grow so large, or that (b) people would want to use it to write anything other than stories. Mea culpa! Having spoken to a number of our authors in the beta group, via email, and even face-to-face (/wave, Protagonize Pub-folk! ), I’ve slowly realized that the ever-growing clutter of mixed content was becoming a major hindrance to pretty much every author on the site. People who were interested in reading stories were never sure of what would show up when they were browsing, people who wanted to write and read poetry were running into the same kinds of problems, and the growing popularity of roleplays was overwhelming everyone. With that in mind, I’ve revamped the stories area quite heavily. The interface isn’t too different, but it should be somewhat improved. As I mentioned in a discussion in the Protagonize Pub earlier this week, what I’ve done is created a new Read page that houses all content submitted to Protagonize, replacing the old Stories page, which in turn has become a sub-section of the new Read area. In addition to stories, you’ll find new over-arching sections for Poetry, Writing Exercises, and Other Works (which includes song lyrics, screenplays, plays, non-fiction, and more) in there, as well. Within our new writing exercises section, you’ll even find a new category for the ever-elusive Protagonize Tennis exercise, which is all about alternating writing a scene or storyline (or basically, anything) between two (or more) authors, trying to keep the results consistent. Good fun, all around! In the process — as I mentioned in the Pub discussion — I’ve had to automagically re-assign a lot of your existing content into those new areas. You may find that some of your poetry, roleplays, and other works have been moved into their appropriate new super-categories. While some of it I was able to re-categorize properly in these new sections, a number of works (particularly poetry) didn’t have matching categories after the move. In that case, you’ll find the works in their respective sections under the Uncategorized category. Feel free to update those as you see fit — I did my best to preserve existing categories as much as possible, but some of them just didn’t work in the new sections. At the same time, you should be able to edit your existing works and move them into the new sections yourself, if you need to. 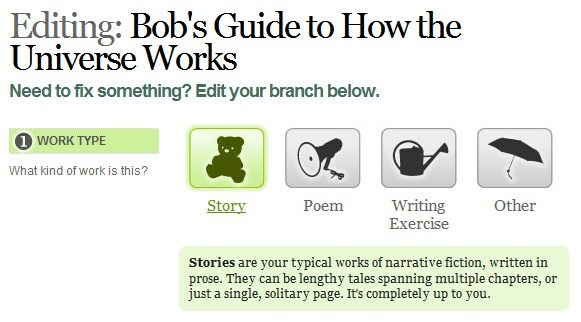 You’ll see some new options at the top of the story editing page that will allow you to select whether your work is a Story, Poem, Writing Exercise, or Other work. I’d also suggest that if you find works that seem to be in the wrong areas, please report them using the Flag button at the bottom of the post in question so that our moderation team can move them into the right spots. I’d love to hear any feedback folks may have about the change — so far, most of the comments I’ve been seeing have been overwhelmingly positive. And as a little taste of additional upcoming changes, I’m going to be working on the My Stories page so that finding and organizing your work will be significantly easier in the future. This entry was posted in Collaborative writing, General, Site updates, writing and tagged interface, other works, poetry, reading, stories, ui, writing exercises. Bookmark the permalink. I spy a Paddytum representing stories. I like it! Now I can actually find half the stuff people request me to read, ha ha! Yay! My reading life on Protag has been made so much easier! Love it!!! Thanks so much, so much more user-friendly! Oh, but now are we going to have features in each of the new categories…? Maniacal, aren’t I? I have just one complaint. There’s just one suggestion I might have. Instead of, when you’re sifting through all that clutter of pages, I think you should try to make it sort by each story, instead of by each individual post or page that there is. Thanks for revamping the site though. It’s great. @Ritu Try clearing your browser cache – I’m not sure if you’re using IE or Firefox or another browser, but you might be seeing some old cached code. CTRL+F5 might do the trick in a pinch.